MS-09G Appeared in Dodge Master Grade! From "Mobile Suit Gundam ZZ", mass-produced MS Dodge that inherits Dom's genealogy was commercialized in the master grade series. The distinctive head, back, rear armor, legs, various arms etc. are faithfully reproduced with new shaping. Updated joint parts, allowing dynamic posing. ● Completely duplicate Dowagge's body shape with new modeling! 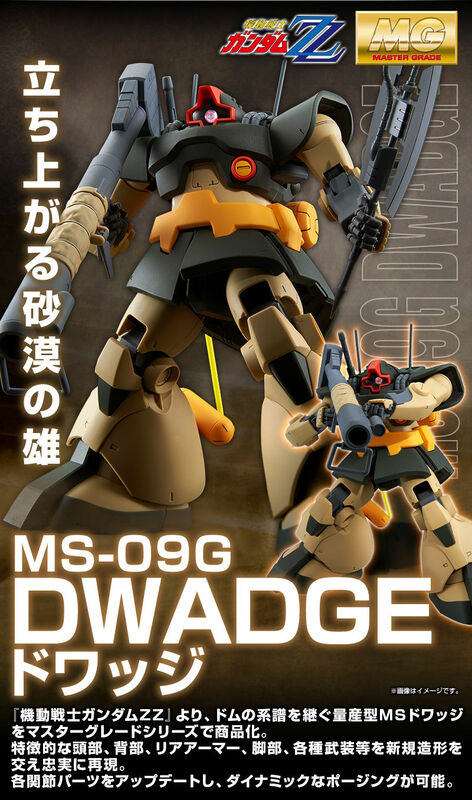 Based on MS-09 Dom, we will add new parts and pursue each shape of Dowagi. The detail of the side of the head which added four Vulcan guns was reproduced by new modeling. Armor and power pipe section from chest armor to shoulder are reproduced with new parts. Reproduce the whole body part with new model parts. Whip antenna, equipped with propellant tank. It reproduces precisely over details such as the inlet of the thermonuclear jet engine and the mold shape inside the thruster. Heat / saber can be mounted on the side. Reproduce the shape of the characteristic rear armor with new modeling. Precise reproduction of "louver" shape for dust control and heat dissipation adjustment during hovering. Add drop tank to calves. The characteristic details of the side are reproduced by new modeling. ● Reproduce a variety of armed variations with new shaping! Completely duplicated armed weapons of Dowaggi with new shaping. A giant buzz equipped with additional smoke · dispatching equipment was recreated with some new parts. Moreover, with the grip parts which added raised type ribs of different angles, high holding power and the freedom of posing are ensured. Reproduced fighting weapons with Heat · Hawk double-edged with new shaping. Reproduced heat saber with new modeling. Built-in trigger type ribs realize high holding power. ● Update the joint mechanism! Updated joint part from MG MS-09 Dom which is base kit. Three-dimensional form with carrying performance of MG latest format. A swing mechanism to the front of both shoulders is mounted. The pose which makes an impressive giant buzz is determined smoothly without interference of each part. A swing mechanism is mounted from the root of the thigh to the front and back. Along with the stability of the ankle realized a powerful posing. A side swing is added to the thigh portion, and it corresponds to various movement. Changed to emotion manipulator which fixed the wrist in latest MG format. Flexible five-finger independent movement realized. ● Water transfer type decal including new design comes with!